Netflix is getting witchy. Starting Friday, the subscription service will debut its latest horror venture, the 10-episode, Kiernan Shipka-starring Chilling Adventures of Sabrina. The show is a delight; it's a fascinating depiction of modern-day witchery that uses its central character as a catalyst for the ownership of female autonomy. Shipka's Sabrina Spellman lives in the fictional Greendale -- an everyday Americana sort of town with no real geography -- but is torn between its picket-fence normality and the witch-world that calls to her. You see, Sabrina is half-mortal, half-witch, a hybrid who rebels against the conflicting institutions that hope to own her. It's a salient series with a lot to say about family, friendship, and female interiority. But it's also a title that might confuse those who most associate Sabrina with the Melissa Joan Hart '90s series or, if you're a bit older, her sprightly comic days. Here is a primer on all-things Chilling Adventures to get you caught up and ready for Netflix's latest delectably bingeable series, and to show how it's both reminiscent and separate from its comic past. It's based on a comic book series that started in 2014. The character Sabrina Spellman first appeared in Archie's Madhouse #22 in October of 1962, and soon became one of Archie Comics' most popular characters. She received her own volume in 1971 and an animated show, Sabrina the Teenage Witch, to go with it. In her early incarnations, Sabrina was a bright and bubbly "good witch" who fit seamlessly into the gee-gotcha Archie universe. But in 2014, writer Roberto Aguirre-Sacasa re-imagined the character and her story for the rebooted comic series Chilling Adventures of Sabrina after the success he had with Afterlife With Archie -- a serialized horror-spun take on the classic Archie characters. Aguirre-Sacasa's Sabrina retained her innocent facade, but the world around her was far more hellish. Instead of hand-waving easy magic, the Chilling Adventures Spellmans are Devil-worshippers pledged to the Dark Lord who worship at the Church of Night. The mythology is darker, deeper, and macabre -- a true horror story. Aguirre-Sacasa transitioned from comics to TV and launched the hit CW series Riverdale in 2017. Though he originally planned to bring Sabrina onto that show, he later decided to keep Riverdale more firmly planted in reality (i.e. no magical witches), and thus Chilling Adventures of Sabrina was developed as a TV series for Netflix. The Netflix show looks to hew to the plot of the comics' first volume, in which Sabrina has to make a choice between witch life and mortal existence with her boyfriend, Harvey Kinkle. One major difference between the comics and Chilling Adventures, however, is that the comics are set in the 1960s, whereas the show is set in contemporary America. Don't let the suspicious lack of cellphone use fool you! It's totally different than the '90s sitcom. If you're a child of the '90s, you'll best-remember Sabrina Spellman as the lead character of ABC's Sabrina the Teenage Witch, which starred Melissa Joan Hart and aired from 1996 to 2003. That show -- as part of the channel's TGIF lineup -- was a candy-colored, 30-minute sitcom with an upbeat spirit and fast jokes. Netflix's Chilling Adventures, on the other hand, is a dark and moody one-hour genre study. Plenty of characters are carried over from the sitcom (and technically the original 1960s comics): Sabrina's aunts, Hilda and Zelda (played here by the delightful Lucy Davis and the perfectly evil Miranda Otto), her mortal boyfriend Harvey (Ross Lynch), and her famous black cat Salem (more on him in a bit). But the format and tone are wholly their own thing; the Netflix show takes the bare bones and cranks them up to far-scarier Halloween levels. Unlike the ABC version, Chilling Adventures is something you might want to watch with a blanket. Salem is in the show -- but he doesn't talk. Sabrina's famously acerbic black cat Salem was a standout in the '90s TV series. 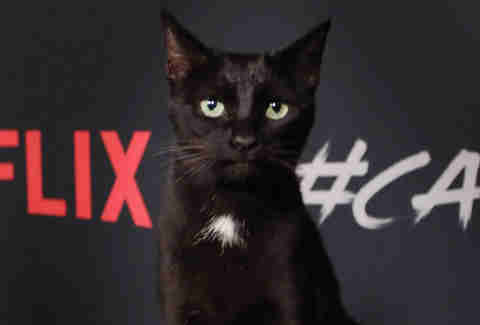 Fans were worried that he might not fit into the more grounded Netflix show, but worry not: Salem is also a bit part of Chilling Adventures. But unlike his '90s counterpart, this version doesn't talk. In the old show, Salem was actually a 500-year-old witch who was turned into a cat once he expressed a desire to take over the world. In Chilling Adventures, Salem is Sabrina's "familiar" -- a supernatural entity in animal form that assists a witch -- who comes to her in the form of a woods-goblin-turned-cat. Though Salem definitely has a major presence in the new show, you might notice right away that he shares little screentime with Shipka. This is because the actress is severely allergic to cats, to the point that, according to Vulture, she broke out in hives when handling the stunt cats. "The cat is the one cast member I don't get along with," she added. It's not a Riverdale spinoff. Roberto Aguirre-Sacasa struck gold with Riverdale, the CW's prized cow that was a breakout hit with critics and fans alike. 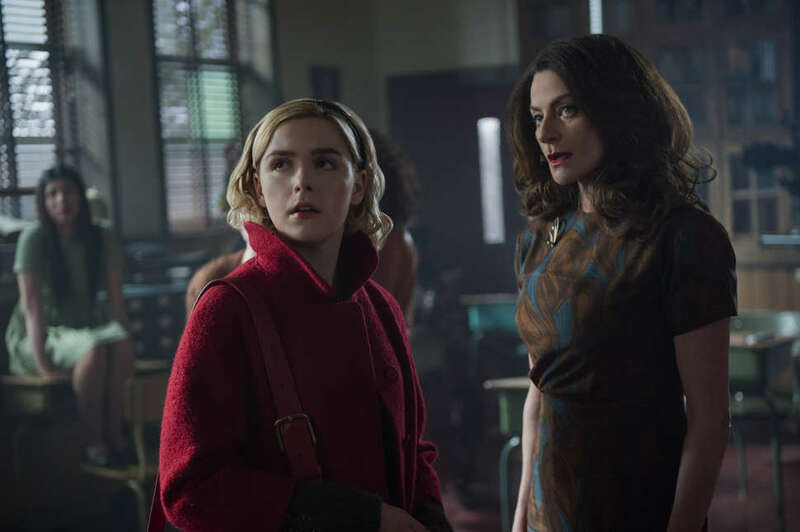 That series has more of a neon-noir vibe than a supernatural one, but that didn't stop Aguirre-Sacasa from hoping to bring Sabrina into its fold. In fact, he originally planned to introduce Sabrina at the end of Riverdale's first season -- as a tease for what future seasons might hold. But that plan eventually changed. "For various reasons, and I think partly because Riverdale found its footing as more crime show, that felt less and less like the right fit," Aguirre-Sacasa told Entertainment Weekly. "It felt like if Riverdale is crime and pulp and all that stuff, then Sabrina could be horror. It felt like there was a separation between Greendale and Riverdale -- magic should exist in Greendale, but not in Riverdale." Still, Riverdale fans needn't worry. Chilling Adventures has been described as a "sister show" to Riverdale, and that's immediately obvious from its opening frames. Both series feel spiritually linked by their gothic aesthetics and neon-drenched shots. Though rights issues may prevent a full-blown crossover, it isn't hard to imagine these worlds bleeding into one another. Chilling Adventures is a straight-up horror show. Aguirre-Sacasa compared his new Sabrina series to horror movies like Rosemary's Baby and The Exorcist when he was originally marketing it, and those influences become immediately obvious when watching. The show directly deals with Satanic panic, exorcisms, and the occult, in ways that feel like odes to horror film history. Characters even reference "tannis root," a spooky -- but fictional -- herb that first appeared in Ira Levin's Rosemary's Baby novel. But beyond just literary markers, the show lives in its dark, witchy influence. It may share some tonal similarites with Riverdale, but it's more viscerally scary, and uses its set design -- from the mortuary where Sabrina lives with her creepy aunts and banished warlock cousin Ambrose (Chance Perdomo) to the halls of the Academy of Unseen Arts, a devilish Hogwarts -- to establish more sinister, creepy roots. Even with so much history behind it, Chilling Adventures forges its own path.